Timotei Natural Style Hairspray, Gel, Mousse and Hair Dye were promoted in 2005 with an eye-catching portrait of a male lion. Timotei shampoo was launched in Sweden in the 1970s, and introduced to the UK in 1983 (see Timotei UK), and is now under the umbrella of Unilever UK. The name ‘Timotei’ comes from Timothy Grass. Perhaps this was taken into account when choosing a location for the lion shot. 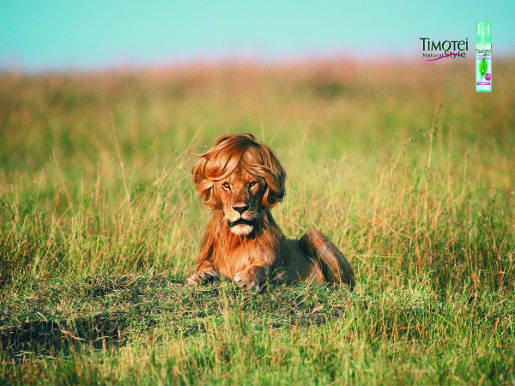 The Timotei Lion print campaign was developed at JWT, Paris, by creative director Andrea Stillacci, art director Laurent Escoffier, copywriter Vincent Détré, account managers Stéphane Billard, Chloé Pigeon, Laure Poquet, and Nathalie Cortial, and co-managing director Stéphane Billard, art buyer Carmela Guiragossian, working with Timotei advertising managers Marie-Anne Aylmerich, Elisabeth Lanner, and Justine Portrat. Photographer was Philippe Gueguen, with retoucher Hélène Chauvet at Kilato. The Timotei Lion campaign won the Public Grand Prix de l’Affichage, 2005, and a silver award in the Epica Awards, 2005.